I will also improve the method of representing the ocean surface to allow local changes of the sea level or/and ocean coverage mask. However, with the current global sea level setup, this would again cause mostly the wrong areas to be covered by lakes. It could be "hacked" by simply changing the atmo pressure on Mars to 0.015 atm in the catalog file. So, my suggestion is to change two things in the hardcode of Space Engine: 1) Change Mars' atmospheric pressure from 0.00618 atm = 6.1 mbar to 0.0117 atm = 11.55 mbar; 2) Rename the parameter for all planets from "Atmospheric pressure" to "Max. atmospheric pressure" - because that's what it actually is Consider this: Earth's pressure is given with exactly 1 atm in Space Engine, however this value is only reached around the Dead Sea, the lowest exposed spot on Earth. In reality, however, it is 429 meters below sea level and the average pressure there is 1.0079 atm. Question: Is the computed pressure based on the altitude relative to the planetary radius? On Earth, within Space Engine, zero altitude is reached only around the Dead Sea, which, as I said, is actually 429 meters BELOW it. So, if the pressure is tied to the altitude, you'd simply have to correct the values for Earth and Mars (possibly later also Titan? ), normalizing it to locations at zero elevation, e.g., Hamburg and Gusev crater. I've asked a colleague of mine who is part of the DAWN team for the best available global mosaic of Vesta... I'll keep you updated. Let me know if you have problems converting *.cub files. If needed I can convert them to TIFF or PNG. I already have both of those maps, and others (including a color map), and have put them in SE. But all of them have problems, none of them have the necessary quality to be a default map. I planned to release them as addons, but I never got around to it. Someone eventually needs to make a "corrected" version of these maps, to remove errors, artifacts, and gaps. I did what I could with the color map, but unfortunately the necessary fixes to get them to the quality they should have are far beyond my ability. Which errors do you mean? I cannot see any gaps other than the shadowed area around the north pole (due to DAWN observations, which took place during Vesta's northern winter). As for the resolution: The offered *.cub file is at 74m/px, which is the native resolution of the constituent images, so this is the maximum resolution available for a global mosaic (certain parts of Vesta were imaged at higher resolutions). btw: Venus is awesome! If, one day, Space Engine allows alternate surface textures to be activated, be sure to include M. Ivanov's global geologic map. GREAT map by a great guy; and I should be able to obtain a full resolution version without any coordinate grid etc. 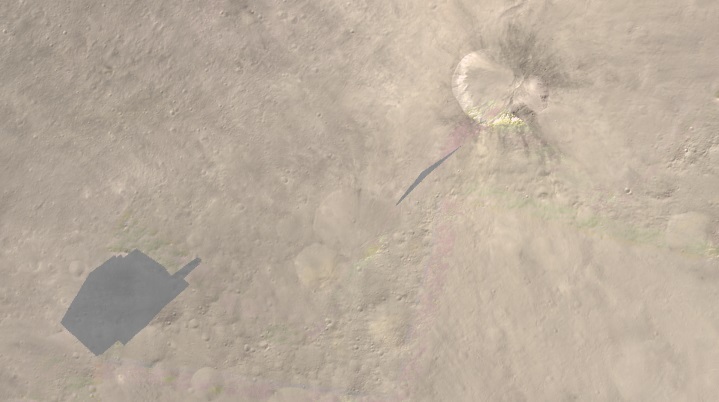 There are subtle errors in the height map (artifacts on crater slopes, the entire north pole, seams at +/-180 deg). They're not very apparent until you see it in SE. The albedo map is shaded, which just plain looks bad. The color map is a better non-shaded map, but it has gaps and artifacts. None of that is good enough to be a default map. I see. Which albedo map are you referring to? How did you acquire and export the DTM? I am still in contact with my colleague, maybe he knows something. 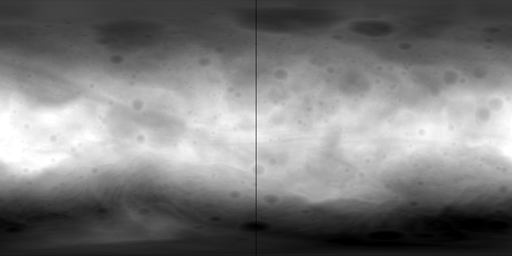 So, the current Vesta in Space Engine is the official DTM overlain with a procedurally generated albedo map? Which albedo map are you referring to? The grayscale map you linked. Not exactly... it uses a map derived from a press release colorized elevation map, and yes color is procedural. How did you acquire and export the DTM? I acquired it in .pds format from here and converted it using IMG2PNG. I got the other maps I looked at/used from the same server. Here's a snippet of my current edit of the color map, and you can see the gaps and artifacts (artifacts have been reduced from the original map, but are still visible). 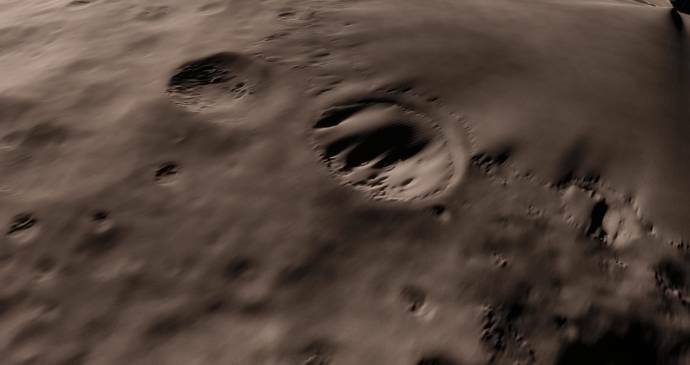 That grey-scale map is not an albedo map, it is a visible light photo mosaic, and therefore contains shadows and some perspective distortions. I inquired whether there is an albedo map available for Vesta. I am waiting to hear back from my colleague. When I am back at my office later this week, I'll download, process and convert the final global DTM from the USGS website. What format/projection does Space Engineer need it in? 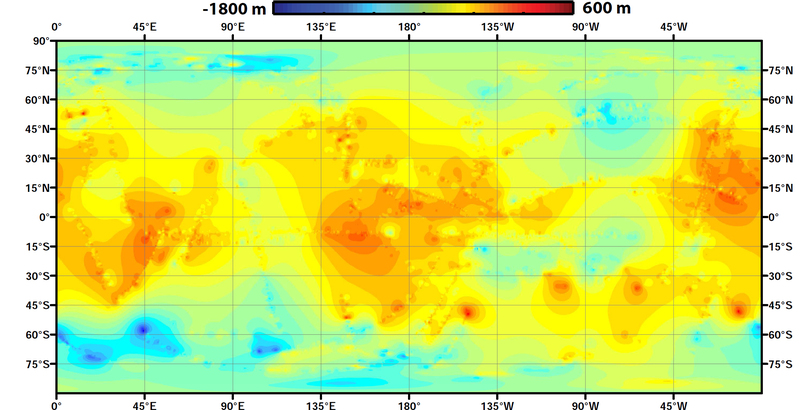 It's a single-wavelength map where all variations that are not caused by illumination effects are caused by albedo changes. I meant it in that sense. What format/projection does Space Engineer need it in? It's best to provide it in simple cylindrical projection (equirectangular projection), ideally with 0 longitude at the center. And: I assume a greyscale version would be best? Photoshop raw format (.raw) is most convenient, but as long as it remains a lossless 16-bit image it doesn't really matter. Whatever is easiest for you. And yes, grayscale. Lossless 16 bit grayscale in cylindrical projection. 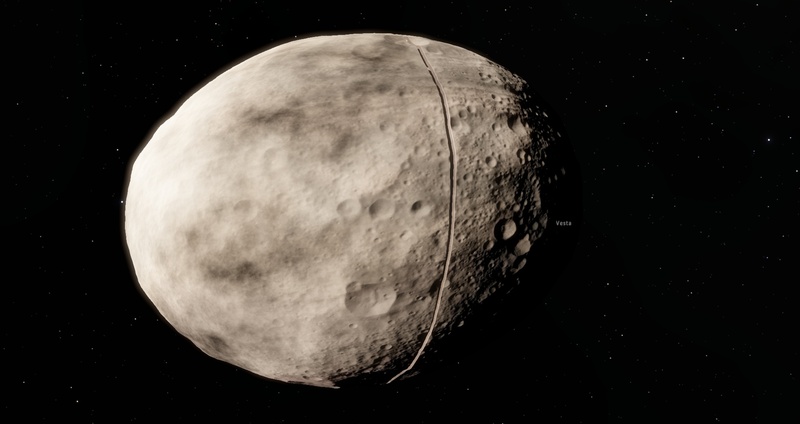 16 bit is very important, you can look at current Vesta model in SE to see how 8 bit precision affects on a highly irregular bodies. Projection could be "cubic" (quadrilateralized spherical cube), if it will have better quality or needed less conversion. But SE needed an extra data added to the edges of each face to fix texture seams (the bordering pixels must be a copy of the edges of the adjacent faces, but this could be done manually in photoshop). There you go, I've sent you a PM, SpaceEngineer. Let me know if that works for! Did you receive my PM, SpaceEngineer? All these errors could be fixed in a raster graphics editor, after few hours of work. We just had a hope what the artefact-free global DEM exist, but it seems it does not. 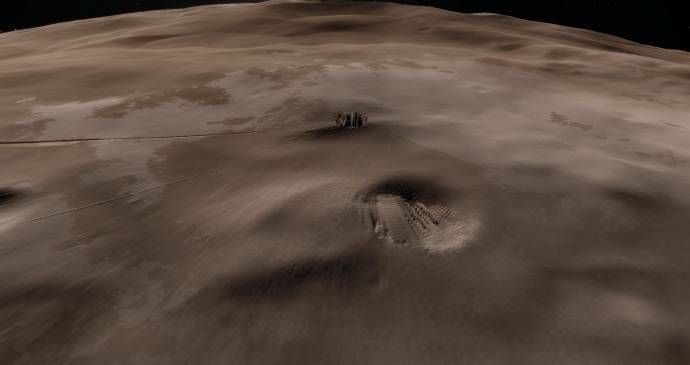 As for the interpolation at the north pole: There is simply no data available for Vesta's north pole. 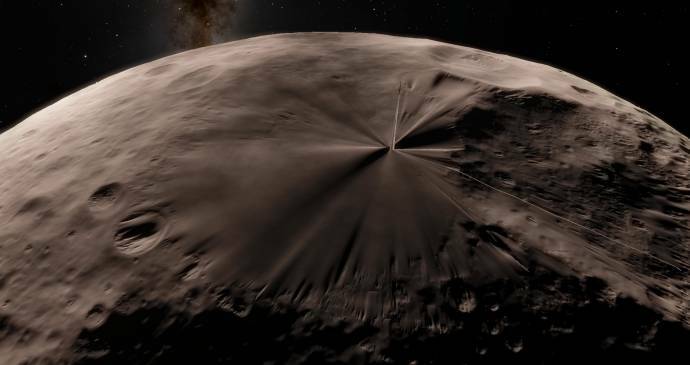 Dawn observed Vesta during most of its northern winter, and some areas never received sunlight during the mission. As Dawn does NOT carry a laser altimeter (was scrapped due to weight reasons...), the DTM is solely based on stereo-pairing the visible light-images by the Framing Camera. Therefore, we have no topography data for the north pole and a few surrounding crater floors. At least one thing seems to have worked: The "granular/knobby" effect of the 8-bit-DTM used in 0.9.7.2 is gone, right?